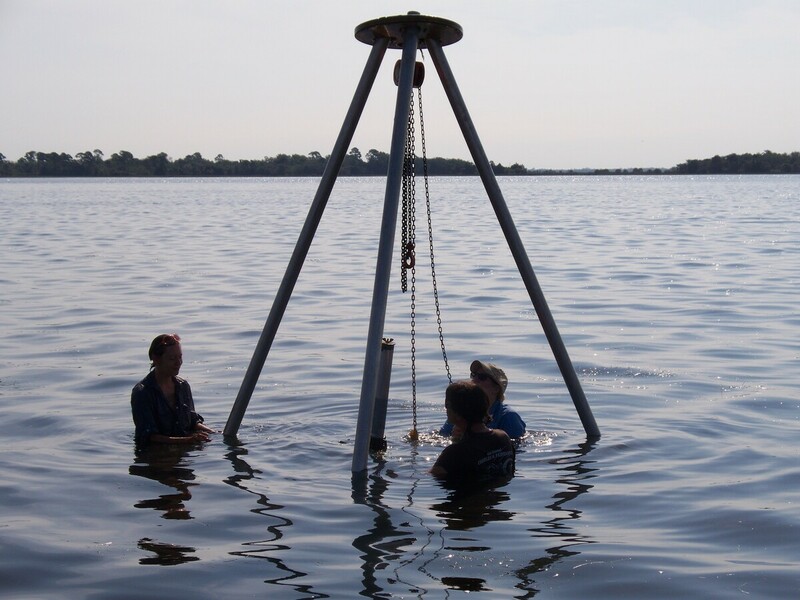 What Can We Learn From Early Floridians On Sea-Level Rise? Sea level rise is not a new challenge for Florida. The state's earliest residents had to cope with rising seas by migrating. It is a lesson, an archaeologist believes, that we can learn from today. Rachelle Ianelli (left) and Austin Jacobs (middle) both archaeological students from University of Florida, together with Florida Public Archaeology Network representative Rachael Kangas, excavate a section at "Garden Patch," a settlement populated after rising seas forced people to leave Bird Island. 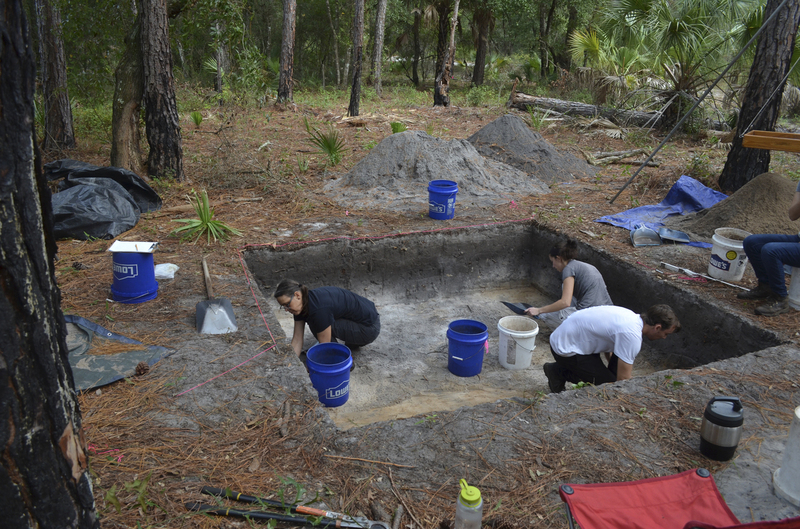 McFadden, a geoarchaeologist, examines Florida's first human settlements. At the bottom of the core are limestone and fossils from the Eocene epoch. From the cores she examines, McFadden sees the beginning of big changes around 450 B.C. 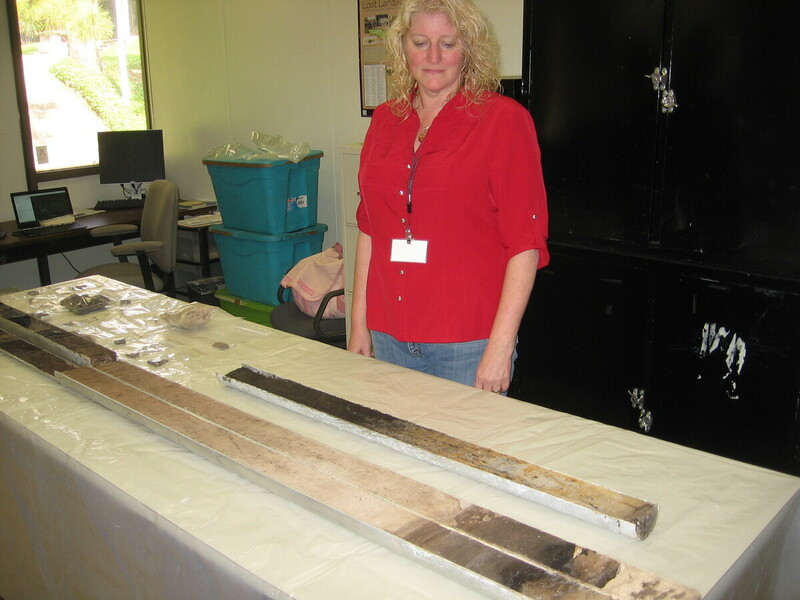 Paulette McFadden examines some of the 24 cores that detail the history of the pre-Columbian settlements in Florida's Horseshoe Beach area. "We can see sea level rising," she says. With climate change, there is a new realization that sea levels around the world are rising at an increasing rate. But rising seas aren't a new phenomenon. Coastal communities have had to adapt to sea-level rise and shifting coastlines since the end of the ice age. Worldwide, sea levels began rising more than 10,000 years ago. As it was in the past, Florida has a flat land mass with a long coastline — which means even a small rise in sea level there inundates a very large area. McFadden says she found something surprising when analyzing the core samples: A period around 2,000 years ago when sea levels suddenly spiked. "Sea level rates really increased significantly and the system couldn't equalize," she says. "This inundated about a mile and a half of land area very quickly." It was a rapid rise in sea level archaeologists have also found at other sites on the Gulf coast, likely the result of melting glaciers from global warming. McFadden believes how Florida's earliest residents coped with rising seas offers lessons for today. Horseshoe Beach in Florida's Big Bend region is a small vacation community with waterfront houses and private docks. We take a boat out to Bird Island, the earliest human settlement in the area that's still above water just a quarter mile from the mainland. "All of this area here that's so very shallow was all terrestrial when Bird Island was first inhabited," she says. In other words, Bird Island used to be connected to the mainland. Researcher Paulette McFadden (in hat) and graduate students (Andrea Palmiotto and Melissa Ayvaz) work to extract a sediment core from and area in the Gulf of Mexico near Bird Island. A few people still live on the Island. Patsy Nelms' family has owned it since buying it from the government as military surplus after World War II. "The island has changed shape over the years," Nelms says. As the sea level rises, parts of Bird Island are beginning to wash away. Nelms takes us to a small sandy beach area where erosion is exposing artifacts and occasionally, human remains thousands of years old. Nelms stoops down and hands McFadden pottery shards she picks out of the sand. People lived here for more than 2,000 years until rising seas cut the area off from the mainland, making it an island. Bird Island inhabitants relocated, eventually settling inland. McFadden says these were people who were well aware of the changing coastline and rising seas and for whom adapting to the environment was a way of life. "I think there was always the expectation of at some point, maybe it's not in my generation but within my grandchild's generation, we're going to have to move," McFadden says. "So I don't think that it was quite as traumatic as it is perhaps for us today when Miami floods." She says when it came time to move, the original inhabitants chose the site of their new settlement carefully. It had freshwater, it was just a short canoe ride away from fish and oysters in the Gulf, and it was far enough inland that it was protected from storm surge and rising seas. The decision to relocate, she believes, may have been connected to that rapid spike in sea level 2,000 years ago. It's an experience she believes officials and city planners can learn from. "We're going to see similar things happen. We're going to see the shoreline move in a couple of kilometers in some areas. We're going to see large amounts of beach erode away," she says. "So, understanding how people in the past dealt with that sort of event can help us to navigate the pitfalls of another event very similar to that." Other settlements may hold more answers about how early Floridians adapted to climate change and rising seas. Unfortunately, the earliest human settlements in Florida are now believed to be underwater — at the bottom of the Atlantic Ocean and Gulf of Mexico.